Winery-Sage.com categorizes wineries into two different groups. A report will be generated when you click on either of the links directly below. The link below will generate a report for all wineries with complete encyclopedia listings. To access the page for a specific winery, click on the link labeled “Winery Name” in the report generated by clicking the following button. * This list changes on a weekly basis with new Wineries getting their bonds or existing ones going out of business or being purchased. There are also several categories that we’ve chosen to exclude. Smaller wineries with a total production of less than 250 cases aren’t counted because many of these are hobby wineries rather than going concerns. Also a number of large-scale producers have 2nd brands (i.e. Mondavi has Woodbridge), but these are brands rather than actual wineries. Our Wineries directory is designed to help you find Wineries that match your interests while excluding all others. It is designed to provide a manageable amount of targeted information rather than providing an overwhelming amount of data. Use either of the two links near the bottom of this page to create different directory lists. The “Sortable Report” provides a directory of all member Wineries and lists approximately 20 different characteristics that can be filtered and sorted. The Encyclopedia page for each Winery can be found by clicking on the Wineries name in the directory report. The “Complete list of Known Wineries” provides a directory of all know Wineries in California, Oregon and Washington and the county in which they are located. County: The county is provided to give site users a better geographic idea of where the winery is as many people are not as familiar with AVAs. Wine Club: Does the winery have a wine club that offers benefits to members. Main AVA: This is the largest AVA in which the Winery is located. Wine Club Benefits: Assuming there is a wine club, what are the benefits. Sub AVA: If there is a smaller AVA contained in the larger one, it is listed here. Guest WiFi? : Does the Winery offer complimentary WiFi to guests? Average Price Per Bottle: This is calculated by averaging the price one bottle of each type of wine Picnic Friendly: Are there tables and/or grass to picnic on and does the winery allow outside food. Flagship Wine: If the winery is known for or promotes a special wine, it's listed here. Pet Friendly: Does the winery allow pets. In most cases, if yes, the assumption is that it's only outside unless indicated in the detail section of the winery. Region of Focus: If a winery mainly produces wine that originated from one region within a country, it will be listed here. Banquet Facilities: Is there a kitchen and dining facilities sufficient to host events without resorting to external catering? Country of Focus: If a winery mainly produces wine that originated from one country, it will be listed here. Weddings? : Can the Winery host Weddings (note that an external caterer or event planner may be needed)? Typical Product: Assuming the winery puts out significantly more of one type of wine than another: Red, White or Sparkling On Site Lodging: Are there rooms available on the winery site. There is no guarantee that the lodgings at a winery are actually owned by the winery. Primary Fermentation Method: Indicates whether the winery introduces known yeast types or allows native yeasts to ferment the wine Conference Facilities: Are there meeting rooms as well as food services sufficient to host corporate or social events. Minority Female Winemaker: Is the primary winemaker a woman or a member of a minority group? 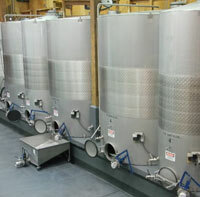 Web Site: Provides a link to the winery's web site. Sustainable Methods: Indicates whether the winery produces any wines that carry an Organic or Biodynamic designation Wine Trail Member? : Listed are any local wine trails of which the Winery is a member. Uncommon Varietals: Does the Winery produce an uncommon Varietal - defined as produced by less than 15% of the Wineries in the State? Barrel Room Special: Is there currently a Barrel Room special on wine or merchandise running.